We live in a nation of sharply etched haves and have nots—and nowhere does that dividing line cut deeper than in the world of housing. Here at realtor.com®, we spend a lot of time chronicling the “haves,” those soaring, seductive, sought-after metros where inexorable rises in home prices are rivaled only by unstoppable increases in wages, jobs, bleeding-edge trendiness, and four-star fusion chefs. 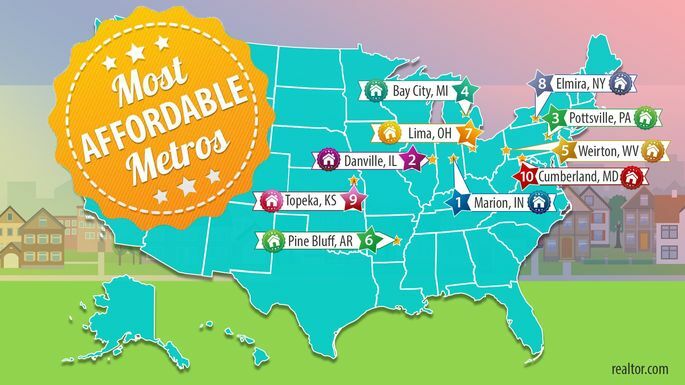 And yet: Have you ever daydreamed about the home you could buy if you moved to one of the truly affordable parts of the country? Maybe you’d have an in-ground pool for mid-morning dips, a charming wraparound porch, space to really entertain. Or maybe you’d just be able to live well and sock away substantial savings … at the same time. And you could do this because you’d be paying just a fraction of what you would in the rest of the country. So the bargain-loving realtor.com data team set out to find where a home buyer’s dollar will stretch the furthest. We looked at the country’s 500 largest metros and identified the 10 with the lowest median home prices. We limited the final results to no more than one per state. So where do you go for homes that will cost you well below the $79,500 starting price of a Tesla Model X? The Rust Belt and Midwest, mostly—often areas that have experienced decades of industrial decline and population loss. A few of them are still struggling with the ills of urban decay, exacerbated by the Great Recession, including a couple with substantially higher-than-average crime levels. But generally, we found something else too: character. Community. Decent schools. Strong infrastructure. And some great old homes that were built and opened during the heyday of each region. Before you let reality sink in and start fretting about such mundane details as where you’ll actually work if you move to one of these places, just think about all that money you’ll be banking. Do you see yourself as a bargain hunter with a big-picture outlook and a willingness to pull up stakes? If so, grab your checkbook, and let’s head over to the places where homes are priced like sports cars. Maybe after a few years of deep-dive savings, you’ll be able to afford one of those too. The dollar goes far in Marion. It’s only about an hour and a half northeast of Indianapolis, but homes cost about two-thirds less than in Indiana’s capital (where the median price is $209,950.) They’re also only about a quarter of the national median list price of $269,900. Now that’s a bargain! Charmayne Saylors, a broker at FC Tucker Realty Center in Marion, says that for around $70,000, a buyer could get a three-bedroom home with a garage. The low price of Marion’s homes is directly correlated with hiccups in the region’s historical wage growth. But that situation is improving at a steady clip. Unemployment in Marion County is extremely low, at just 3.3% in November 2017, according to the U.S. Bureau of Labor Statistics. This Corn Belt metro’s economy is based heavily on (you guessed it) agriculture. But like most Midwestern cities, it still hosts some large manufacturing employers, including General Motors. In 2016, the car company announced that it would invest $91 million in the Marion Metal Center, which employs more than 1,000 workers and produces sheet metal for vehicles made across North America. Just check out this three-bedroom ranch priced only at $74,900. If you really want to splurge, go for this five-bedroom, 5,648-square-foot home for $599,900—the highest-priced home listing in Marion. If those savings aren’t enough to make you consider renting a (discount) U-Haul, the state of Indiana also boasts the fourth-lowest property taxes in the nation, the ninth-lowest sales taxes, and the 10th-lowest income taxes. 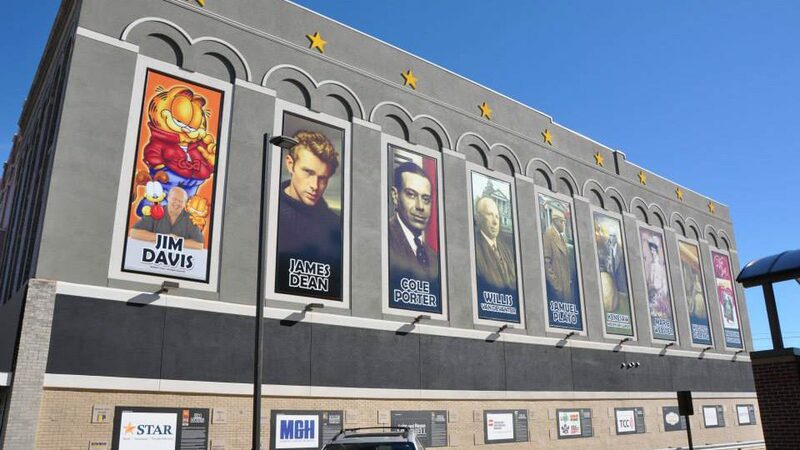 And you’ll be in fine company: Marion is the hometown of the cultural icon James Dean, as well as Jim Davis, the creator of Garfield. Yes, the cat.